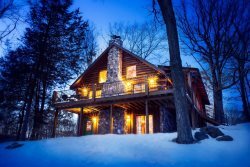 Overlooking beautiful Lake Delton, this three bedroom cottage is a perfect getaway. Enjoy swimming, fishing, boating, or just plain relaxing at your home away from home. Features include kitchen, three bedrooms, one bath, wall A/C, cable TV, 42 foot pier and rowboat (weather permitting). Step out onto the deck for your grilling pleasures or enjoy the fire pit. Again just a great time for my entire family.Thanks sooo much and we will be back! George is wonderful as usual!! So helpful and pleasant!! It's aIt's very comfortable and convenient. Owners are awesome!! They are friendly and there is you need them, but let you enjoy your privacy. It's nice that they let us bring my Mom's little dog. We could not vacation without him. very comfortable, very relaxing. It allows you to just chill. Everyone is so helpful and willing to make our stay memorable every time. I really like that aspect. Had the best time at the Hiawatha Haus, the lake view was incredible. A great family vacation again for us there. .
George is always a joy!! Nice and relaxing place to stay. We work with Marci and George and both have been wonderful. We love our cottage. It needs some work but its our 4th year there and it feels very much like home. We'd love to buy that cottage if Bill would ever consider selling it! We've been using sand county ever since one of the ma n pops closed down. So 10 years maybe? Always professional and make our visit very easy. That's why we keep coming back! Of corse George was great and always very courteous.We love him. It was great.We love staying in your properties.We switch off places every year so we can get a new experiences all the time. Everyone has been very friendly and helpful with any questions that we had. We really enjoyed our stay and the way everyone was so friendly and helpful. Are looking forward to doing it again in the fall. Loved it! Everything was so peaceful and comfortable! We will most definately rent this property again! We can't wait to come back!! Loved everyone that I worked with. Everyone was very helpful. When getting to the house with my family of 5, 2 adults and 3 children, the best part of staying here was that we had our own private yard, pier and row boat to take the kids out in. The kids got to swim daily and the hubby and I enjoyed fishing and sitting by the fire every night once the kids were in bed. Great house, easy to get to everything in town from this location and loved being on the water.